Manchester United have held talks with representatives of ex-Chelsea manager Jose Mourinho, the BBC understands. 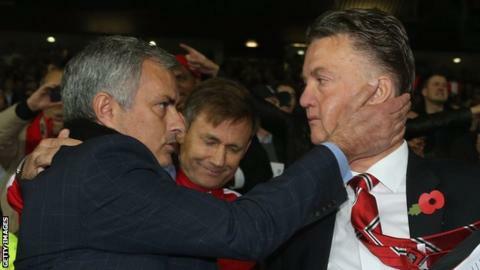 The 53-year-old Portuguese, who was sacked by the Blues in December, is increasingly hopeful of succeeding Louis van Gaal at Old Trafford. No agreement has been reached, and the club have made no comment, but negotiations have begun. Dutchman Van Gaal, 64, is expected to leave United at the end of the season - one year earlier than scheduled. That would leave the way clear for Mourinho, who is known to be excited by the prospect of taking over at Old Trafford. The United hierarchy are thought to be keen to respond after Manchester City secured the services of coveted former Barcelona coach Pep Guardiola earlier this week. Mourinho's arrival would mean a resumption of a rivalry that began in Spain when he was coach of Real Madrid between 2010 and 2013. Twice in recent weeks, Van Gaal's tenure has seemed perilous. However, defeats by Stoke on Boxing Day and Southampton on 23 January have been followed by an improvement in both form and performance. United, who are five points adrift of the Champions League places, play Chelsea on Sunday (16:00 GMT). It is widely assumed the most obvious alternative to Mourinho is Ryan Giggs, Van Gaal's assistant. The Welshman, who joined United aged 14, made a record 963 appearances for the club and won 13 Premier League titles. The 42-year-old took over as manager on an interim basis in April 2014 following the sacking of David Moyes. Although he has not spoken about the United job since Van Gaal took over, it would be a surprise were he not interested in replacing the Dutchman should the opportunity arise. However, while Giggs was happy to further his education under Van Gaal, he is unlikely to be as willing to work with Mourinho. What went wrong for Mourinho at Chelsea? Mourinho's first spell as Chelsea manager lasted from 2004 to 2007, and included two Premier League titles. On his return, he again led the London club to the title, but left just seven months later. He made a disastrous start to this season, losing nine of the first 16 league games, and departed with the team 16th in the league, one point above the relegation zone. The former Porto boss fell out with the Blues' medical team, in particular club doctor Eva Carneiro, after describing them as "naive" for running on to the pitch to treat midfielder Eden Hazard during a draw against Swansea in August. Carneiro, who left the club on 22 September, is taking legal action against Mourinho and the Blues. How is his relationship with Man Utd? Mourinho has never hidden his admiration for United, and particularly their legendary former manager Sir Alex Ferguson. Speaking before taking his Inter Milan side to Old Trafford for a Champions League last-16 tie in 2009, he said: "I want to face the best and United are a team of champions with a super coach in Alex Ferguson." But after being linked with the manager's job following the departure of Ferguson in 2013, he declared his allegiance to Chelsea. "I would have turned down every job in the world - the Manchester United job, every one - for Chelsea," he said. There were reports last month that Mourinho had written a six-page letter outlining his suitability for the United role, but that was dismissed as "absurd" by his agent. Before the red carpet is rolled out to welcome Manchester United's new manager, a word of warning. Talks should not be interpreted as an agreement, as an offer, or even the promise of one. None of that has happened. Neither should we assume Ryan Giggs is out of the running, nor that the merits of Laurent Blanc and Mauricio Pochettino, the two other realistic candidates for the job, have been discarded. The fact is, given the pressure Louis van Gaal has been under recently, United's hierarchy simply would not be doing their jobs properly if they did not at least get some idea of the thinking behind the major candidates. And what of Van Gaal? He may have twice looked as though he was on the brink of being sacked, but he is still in a job and on Tuesday his side delivered their best performance of the season in beating Stoke 3-0. Even Manchester City manager Manuel Pellegrini accepts United are not out of the Premier League title race just yet - and if they did win it, there would be no vacancy for Mourinho to fill at the end of the season anyway.